Our barrier-free dental practice would like to help you overcome any fears you may have of a visit to the dentist with its friendly ambiance. From the initial consultation through to aftercare, we always provide open and competent advice and, where necessary, also help clarify any insurance issues with your statutory or private health insurance company. You are treated by our team according to the latest scientific findings in three treatment rooms featuring state-of-the-art technology. we will send you a letter reminding you when it’s time to make your next appointment. 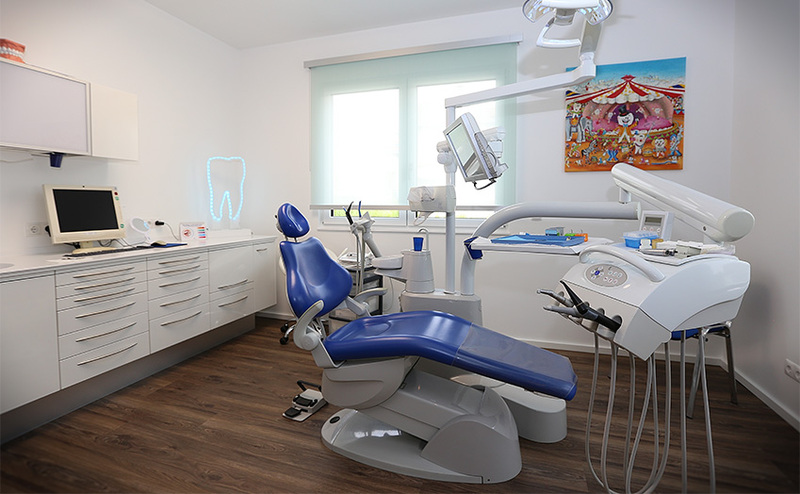 Patients with a phobia of the dentist, children and disabled patients are also able to undergo dental treatment and operations under general anaesthetic. These procedures are performed at the anaesthetist’s practice. We can already address your individual wishes for production of the new dental prosthesis during the initial consultation with our dental technician. Individual selection of the tooth colour allows for the high aesthetic demands to be fulfilled. Constant contact and dialogue between the dentist and dental technician during the production phase ensures optimal design of the dental prostheses. The short distances mean potential delays and the risks associated with shipping are eliminated. Minor repairs and adjustments can be performed immediately.